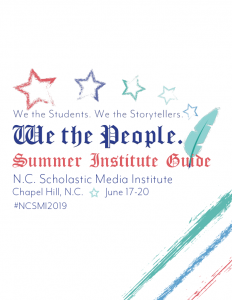 Students and teachers are invited each year to enroll in the North Carolina Scholastic Media Institute on the UNC-Chapel Hill campus. The 2019 Institute will be June 17-20. Instructors travel from across the state and nation to offer their expertise in newspaper, yearbook, online, magazine and broadcast journalism. The four-day Institute is open to journalism and media advisers and to students who are rising ninth-graders through 12th-graders. The schedule includes 20 hours of instruction, plus time for a pizza party and awards presentations. The School of Media and Journalism at the University of North Carolina at Chapel Hill sponsors the Institute. The intensive workshop is designed to teach innovative and effective ways of communicating through scholastic media. Students may enroll in one of the following divisions: newspaper, yearbook, literary magazine, online, photojournalism, design or broadcast news. Advisers may enroll in any of those seven divisions, or they may enroll in the advising division. To access division descriptions, click here. Students may also sign up for staff positions on the Rush, the Institute newspaper. The Rush staff will produce the Institute’s official newspaper in three days. Students who participate in broadcast news produce the Institute’s official newscast. The registration fee is only $250 ($200 before May 1; $300 after May 15) for a top-notch journalism workshop featuring award-winning speakers and instructors. Deadline to register is June 1. Courses in design, literary magazine, news, online news, photojournalism, broadcast news and yearbook. Networking opportunities with student media across the state. Immersive classes in UNC-Chapel Hill’s School of Media and Journalism. An awards brunch celebrating the best in N.C. student journalism. Everyone attending the Institute must also complete a Code of Conduct and Release form. Please submit your release forms below. Scan and upload your students' forms below. Please remember to bring the originals with you to check-in on June 17. Please notify the NCSMA office of accommodation requests 14 days prior to the start of the event. 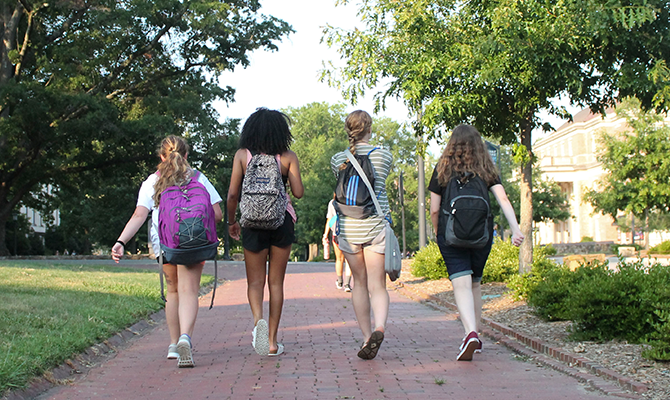 Students will stay in a residence hall on UNC’s campus. They will need to bring their own pillows, towels, washcloths and bed linens. Registration June 17 will be in the residence hall lobby from 9:30 a.m. to noon. Check-out will follow the Awards Brunch on June 20. Advisers will be housed together in rooms near their students. Advisers must duplicate the code of conduct form, have each participating student and a parent or guardian sign them, collect the signed forms and bring them to registration. Advisers should also prepare, have signed and keep with them permission forms and medical (including insurance) information. Each workshop participant will pay a $250 individual fee ($200 before May 1). This fee covers registration costs, faculty, lodging for three nights in the residence hall, entertainment events, awards and the Awards Brunch. Except for the pizza party, meals are not included. Students may secure meals on campus in Lenoir Hall, or in the many restaurants on nearby Franklin Street. Commuters will pay a $150 fee. Full payment is due May 15. Late registration after May 15 is $300. If a participant has to cancel before June 1, a 50 percent refund will be made. No refund can be made after June 1 because of budgetary obligations. NCSMI News is the annual recap of the institute written, shot and edited by students. Taking part in the production teaches students involved about writing for broadcast news, programming and basic production and editing. The NCSMI Photo Show displays the photography shot by students in the photojournalism course to document the institute. The Rush helps students gain hands-on experience by writing, editing, designing and producing the institute’s student newspaper as well as telling other stories of the institute via digital media platforms. The Rush Online combines classroom instruction and hands-on production. Students will learn WordPress basics and how to write for the web. They will collect, aggregate and post online content produced by students in other NCSMI divisions.